The PowerShot SX40 HS is equipped with a Genuine Canon 35x Zoom lens that provides the telephoto power to bring your distant subjects incredibly close. It also features a useful zoom range that begins at 24mm wide-angle and extends to 840mm telephoto (35mm equivalent). The 24mm ultra Wide-Angle allows you to create shots with dramatic perspective and makes it easy to shoot sweeping landscapes, large groups of people and tall buildings. This superb lens delivers outstanding optical performance throughout its zoom range. It’s advanced design employs UD glass, double-sided aspherical glass-molded and ultra-high-refraction-index glass lens elements to effectively suppress chromatic aberration while maintaining a remarkably compact size. The camera uses a VCM (Voice Coil Motor) for high-speed, quiet, energy-efficient lens movement with precise control. The latest-generation Canon DIGIC 5 Image Processor brings phenomenal increases in processing speed and power. Improved chip architecture and algorithms deliver greatly expanded functionality with further refinement in image quality. 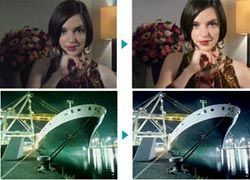 Improved noise reduction produces clearer images when shooting in low light at high ISO speeds. Enhanced i-Contrast performance adjusts differences between light and dark areas to achieve even more natural-looking results. It’s never been easier to shoot videos with a PowerShot digital camera. The PowerShot SX40 HS has a dedicated movie button that lets you start and stop recording instantly. There is no need to go through layers of menus or operate switches or dials to switch to and from video recording mode. The camera is always ready to shoot stills or video whenever you want. The PowerShot SX40 HS also incorporates an electronic wind filter, which suppresses wind noise that can muffle or distort the sound. And unlike less sophisticated point-and-shoot cameras, the PowerShot SX40 HS lets you use the full range of optical zoom when you’re shooting a video. With the PowerShot SX40 HS, you can also shoot video in the Apple™ iFrame format, which is a computer-friendly standard that speeds up importing and editing of videos. It keeps file sizes small, making it more convenient to upload or e-mail high-quality videos. The iFrame format enjoys native support in compatible Mac and Windows video applications, making it unnecessary to perform time-consuming and often quality-degrading conversions. The PowerShot SX40 HS features a convenient and highly useful 2.7-inch Vari-Angle LCD screen that swivels out almost a full 180 degrees. It also rotates through approximately 270 degrees, letting you tilt it up or down to shoot at low or high angles. You can compose freely even when shooting from difficult vantage points and use the full range of angle adjustment even when the camera is mounted on a tripod. You can even rotate the LCD facing forward to capture perfectly framed self-portraits and to join group shots. 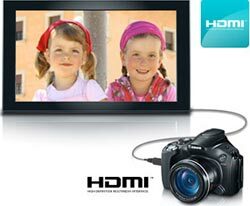 The PureColor System LCD screen has 230,000 dots, giving you a crisp, clear picture to make shooting, playback and using the camera's menu functions especially convenient. Kids & Pets Reduced focusing time freezes fast-moving subjects, so you won't miss those special shots. Increases depth-of-field for sharp and sweeping landscape shots. High-Speed Burst HQ Capture fast-action shots at full sensor resolution, by shooting continuously when the shutter button is held down. Movie The camera takes five photos in succession, and then chooses the best one out of the bunch.